According to the U.S. Census Bureau, on July 1, 2008 there were approximately 304 million residents in the United States. 94 million of those were at least 50 years old. This is the population AARP lobbies for. 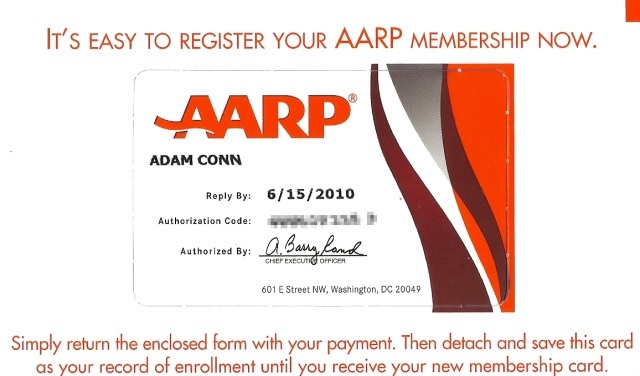 In today's mail I was surprised to find an AARP membership card with my name on it. Are they not powerful enough by representing more than 30% of the population? If they reduce the minimum age for their membership to 35, they will represent 179 million people (or almost 60% of the population). Is this an epic power grab by AARP? Did they decide that 50 is entirely too high an age to be considered a retired person? I might enroll so I can get Kelley a discount on the cruise she's planning. If anyone out there wants to get some discounted orthopedic shoes or anything, just let me know. If anyone has lied about his age on something official that AARP might get ahold of, it's you. Please let me be with you the first time you try to use your new card to get a discount. Dude denial is a bytch. They aren't trying to lower the age to 35. You just look about 50, so they made sure a card was sent to you. That's what you get for all those nights at Studio 54 hanging out with Rick James doing lines of coke back in the 1980's!